Documentaire de création où biographie et histoire, témoignages et archives constituent la trame d’une réflexion autour de la figure de Lumumba, sur l’assassinat politique, les médias, la mémoire. Lumumba: la mort du Prophète offers a unique opportunity to reconsider the life and legacy of one of the legendary figures of modern African history. Like Malcolm X, Patrice Lumumba is remembered less for his lasting achievements than as an enduring symbol of the struggle for self-determination. Peck examines home movies, photographs, old newsreels and contemporary interviews with Belgian journalists and Lumumba’s own daughter to try to piece together the tragic events and betrayals of 1960. 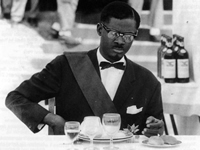 Re-examines the independence struggle in the Belgian Congo and its leader, Patrice Lumumba, from the perspective of a West Indian filmmaker in Europe who lived in the Congo as a boy. The film includes footage from his childhood and the turbulent political events that surrounded him. It recounts Lumumba’s tragic 200 day rule culminating with his assassination. Combines archival footage with memories of former Congolese political activists, former colonial officials, journalists, and Lumumba’s daughter.